It is with the greatest of pleasures that we share our latest presentation - Applying Our Understanding to Real-World Case Studies. This presentation is the culmination of recent work, and it is an important next step in putting one’s growing knowledge of literacy development to use. We may know certain things intellectually - such as the stages of literacy development or the components of literacy - but the true test lies in putting this knowledge into practice. For the purposes of this presentation, viewers will be asked to reflect upon the needs and circumstances of individual learners, and to use this information as the basis of instructional planning. We all know that literacy instruction cannot be a one-size-fits-all solution. For best practice, we need to know where a learner is placed along the literacy journey, so we can provide those experiences that will help the learner continue along in his or her journey. We must see the enormous potential for profound growth in each learner, and we must commit ourselves to providing learners with the right type and amount of sustained practice to make literacy acquisition a reality. Ultimately, what is it that we want? We want learners to be able explore, learn and express - fluently and intelligently. We want learners to be able to take control of the script, so they are able use literacy actively and critically for a range of purposes. Without further ado, we invite you to explore the presentation above. Within the presentation, you will meet Maria, Jonathan, Dakota and David. In the future, we plan to introduce you to a whole cast of others with a focus on providing further opportunities for you to critically reflect and respond to the needs and circumstances of a diverse range of learners. Please explore the video and download the related slides, which can be found above and on YouTube at https://youtu.be/u7eP9nBFG-U. The presentation slides can be downloaded at http://bit.ly/2-Apply-Case-Studies. We highly recommend that you download the slides, since they contain the case studies as well as suggested activities. I wish I could be delivering this presentation in a face-to-face seminar to The Literacy Bug audience. I’d be very curious to know the personal perspectives that you’d bring to the content and the case studies. In the abscence of this opportunity, I encourage you to email your ideas to us at ebrace@theliteracybug.com, or leave a comment below or on YouTube. Please explore and enjoy! After the previous update, you'd definitely be correct to believe that the last video presentation was the final in a series. And it was. Yet, today, we share a new print presentation that stands on its own. 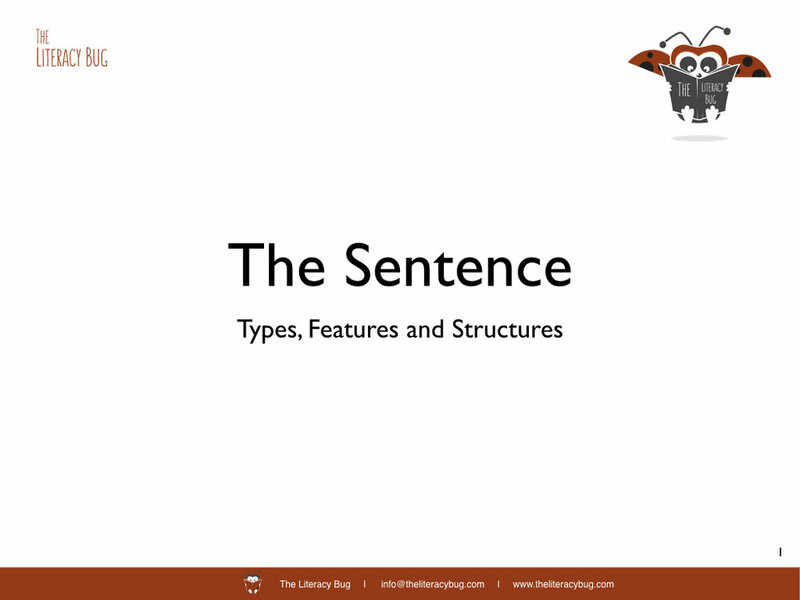 Today, we share "The Sentence: Features, Types and Structures" and the slides for the presentation are available from http://bit.ly/2-The-Sentence. This most recent presentation is - in fact - an older presentation that we chose to revisit and update. The topic - grammar - may not spark excitement in the general audience, yet for me it is something of a secret passion. As a writer, I appreciate balance and economy. I appreciate it when a sentence is able to deliver its message with style and grace. As a teacher of English language learners, I know that teachers need to provide plenty of practice for their students to scan and understand a variety of sentences. This requires gradually helping learners handle sentences of increasing complexity in structure and content. We welcome you to this presentation. One day it may become a video presentation, but for now it is a print one. As mentioned above, the slides are available for download at http://bit.ly/2-The-Sentence. We highly recommend that you download the slides, since the slides serve as a mini-textbook on the topic. When downloading, please be patient. It's a large file, at least in PDF terms (15MBs). I must acknowledge something before I finish, though. This presentation does not address Halliday's functional grammar. Whilst we have become very familiar of this work since drafting the original presentation, we refrained from incorporating functional grammar into the updated version. We'll leave any exposition of Halliday's work to another day. Please explore and enjoy! We hope we have done the topic justice. If you have any questions, comments or suggestions, please do not hesitate to send us a message. Fish, S. (2011). How to write a sentence: and how to read one. New York: HarperCollins Publishers. After the previous update, you'd be correct to believe that the last video presentation was the final in a series. Even I was convinced of this. Alas, there is one more ... I swear ... or believe. Today, we share "Resources for Planning and Monitoring for Effective Literacy Teaching and Learning" which is available below as well as on YouTube at https://youtu.be/R71j5_kegzk. The video is a presentation that summarises a range of resources that can help teachers better plan and monitor for effective literacy teaching and learning. In many ways, it's simply an extension of the previous presentations (listed below). The presentation slides can be downloaded at http://bit.ly/2-Planning-Monitoring-Resources. We highly recommend that you download the slides, since they contain many resources mentioned in the video. Please be patient during download. It's a large file, at least in PDF terms (20MB). Last but not least, below is the podcast episode in which we talk about the latest presentation.